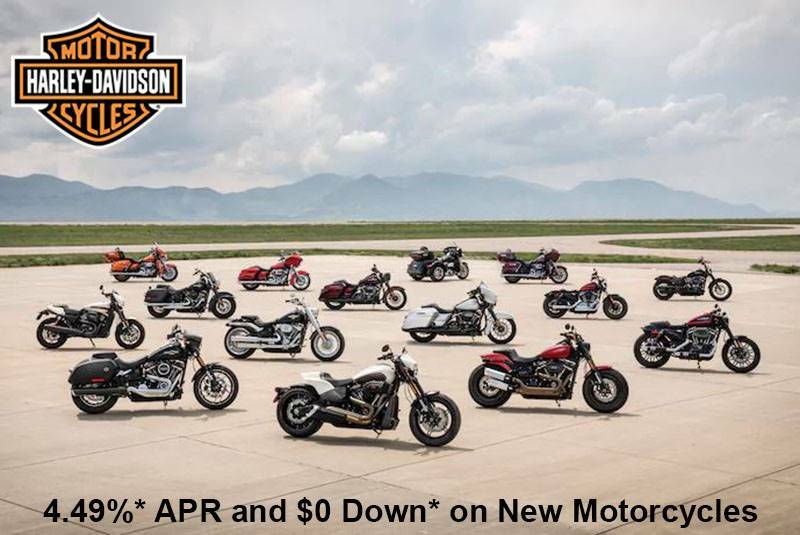 Rates start at 4.49% APR* for new Harley-Davidson® motorcycles with $0 down* options available. See your local dealer for more details. *Financing Offer available only on New Harley-Davidson® motorcycles financed through Eaglemark Savings Bank (ESB) and is subject to credit approval. Not all applicants will qualify. 4.49% APR offer is available on new Harley-Davidson® motorcycles to high credit tier customers at ESB and only for up to a 60 month term. The APR may vary based on the applicant’s past credit performance and the term of the loan. For example, a 2019 Softail® Fat Boy® motorcycle in Vivid Black with an MSRP of $19,049, no down payment and amount financed of $19,049, 60 month repayment term, and 4.49% APR results in monthly payments of $355.04. In this example, customer is responsible for applicable taxes, title, licensing fees and any other fees or charges at the time of sale. APR is calculated according to the simple interest method. Not valid in conjunction with other offers. Other terms, conditions, and limitations may apply. Dealer participation may vary. Financing offer is subject to change or cancellation at any time. See your Harley-Davidson® Dealership for details.